and local laws and regulations. will be randomly selected to win $1,000. 3rd Place – an entrant will be randomly selected to win $500. Sponsor, and (ii) the spouses or dependents of employees or of Board members of Sponsor. November 17th, 2019. Entrant may only request one ticket per mail-in entry. 5. DRAWING: Winners will be chosen at random and will be announced on November 22nd, 2019.
verification of eligibility and receipt of release, the alternate shall be declared a winner. value) may be redeemed for a cash prize of $15,000. Void where prohibited or restricted by law. withholding tax at the time of delivery of the Grand Prize and complete all required tax documents. 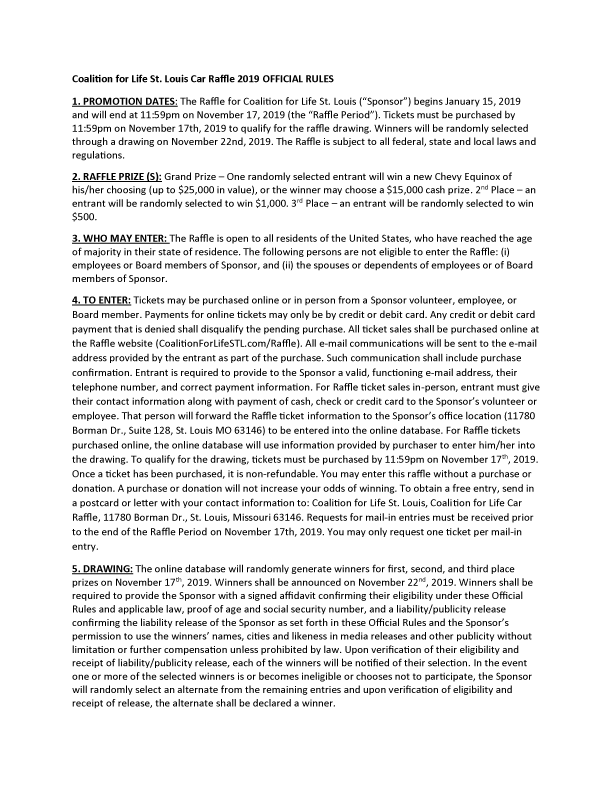 participation in prize-related activities (including any property loss, damage, personal injury or death). particular purpose, and the winner must look solely to the manufacturer for such warranties, if any. winners send a self-addressed stamped envelope to be received by 12/20/19 to: Coalition for Life St.
(“Sponsor”). Thank you for supporting the clients and staff of Coalition for Life St. Louis.